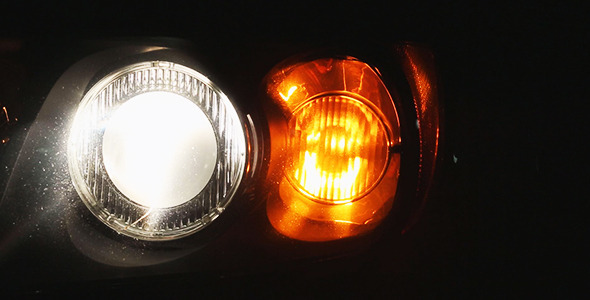 Close-up video of a car headlight turned on and a blinking signal light. Alpha Channel: No; Looped Video: No; Frame Rate: 25; Resolution: 1920x1080; Video Encoding: H.264; File Size: 128mb; Number of Clips: 1; Total Clip(s) Length: 0:18; Individual Clip Lengths: 0:18; Color: Full Color; Composition: Closeup. Amazon Jungle; Santiago de Chile; The Church; Catedral de Ipiales, Colombia; Quito, Ecuador; Pailon Del Diablo, Ecuador; Jardim Botanico in Curitiba. Keywords: automobile, blinking, bulb, car, direction, emergency, flashing, light, modern, night, orange, shine, signal, warning.